The steep decline in the WTI oil price from the recent US$76-per-barrel peak to about US$53 per barrel as of writing has caused big corrections in energy stocks. Here are several energy stocks that are oversold but are still very profitable and offer good dividend income, including Suncor Energy (TSX:SU)(NYSE:SU), Husky Energy (TSX:HSE), and Canadian Natural Resources (TSX:CNQ)(NYSE:CNQ). CNQ data by YCharts. SU, HSE, and CNQ are oversold. The steep decline in the WTI oil price from the recent US$76-per-barrel peak to about US$53 per barrel as of writing has caused big corrections in energy stocks. Here are several energy stocks that are oversold but are still very profitable and offer good dividend income, including Suncor Energy (TSX:SU)(NYSE:SU), Husky Energy (TSX:HSE), and Canadian Natural Resources (TSX:CNQ)(NYSE:CNQ). Suncor is a diversified, integrated energy company with operations in oil sands development and upgrading, offshore oil and gas production, petroleum refining, and product marketing under the Petro-Canada brand. Suncor’s downstream operations in petroleum refining and marketing allow the company to bring in higher profits than pure oil and gas producers in times of low commodity prices. Suncor’s recent net margin was 12.7%. The blue-chip company has an S&P credit rating of A-. It has increased its dividend per share for 15 consecutive years. Its five-year dividend-growth rate is about 20%. Its dividend per share is 12.5% higher than it was a year ago. Suncor generates more than enough earnings and cash flow to cover for its dividend. 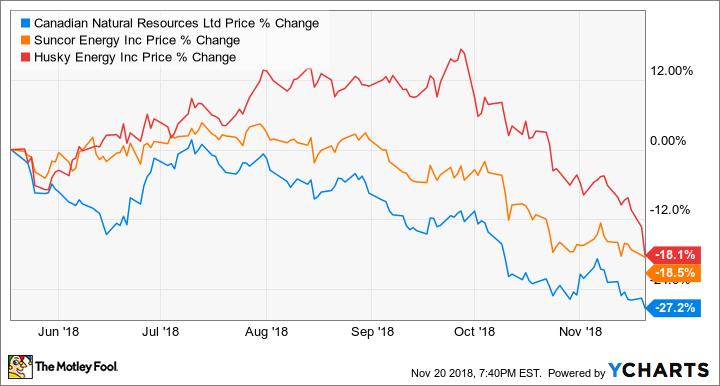 At about $43 per share as of writing, Suncor offers a yield of about 3.3% and near-term upside potential of about 41%, according to the 12-month analyst consensus of $60.60 per share from Thomson Reuters. Like Suncor, Husky is also an integrated energy company. However, Husky is smaller and is not as popular. Still, it has a better credit rating than merely investment grade with an S&P credit rating of BBB+. Husky’s recent net margin was 8.4%. It just re-initiated its dividend this year, which indicates management’s confidence in the company. At $15.93 per share as of writing, the company offers a 3.1% yield and near-term upside potential of about 45%, according to the 12-month analyst consensus of $23.20 per share from Reuters. Canadian Natural Resources is a large oil and gas producer with a diversified production mix: about 38% in oil sands mining and upgrading, about 25% in heavy crude oil, about 25% in natural gas, and about 12% in light crude oil and natural gas liquids. The company has an S&P credit rating of BBB+. Its recent net margin was 16.8%. It has increased its dividend per share for 17 consecutive years. Its five-year dividend-growth rate is about 21%. Its dividend per share is nearly 22% higher than it was a year ago. At about $35 per share as of writing, the company offers a 3.8% yield and near-term upside potential of about 58%, according to the 12-month analyst consensus of $55.30 per share from Reuters. Which oversold energy stock should you buy? Although all three stocks have sold off and are oversold, in the near term, they could feel more pressure if commodity prices remain low, or worse, head lower. However, if you believe commodity prices will reverse and head higher, you should consider buying Canadian Natural Resources for greater upside potential. Otherwise, Suncor is a solid blue-chip name to consider to withstand low commodity prices. If you’re willing to take on a bit more risk, you can consider Husky, which can deliver slightly greater returns than Suncor.